Although primarily grain eaters, sparrows in urban areas have adapted to feed at garbage cans and dumps, backyard bird feeders, home gardens and around outdoor tables at restaurants. Sparrows do not migrate, although some birds may travel several miles to seasonal feeding sites. Most damage caused by sparrows results from their nesting and feeding habits. Sparrows nest on houses and buildings, in backyard or park trees and in shrubs. They can be a considerable nuisance, and often cause unsanitary or odorous conditions. Their droppings often kill ornamental vegetation and can also damage the finish on vehicles. In addition, sparrows can be a factor in the dissemination of several diseases such as chlamydiosis, salmonellosis, Newcastle disease, toxoplasmosis and transmissible gastroenteritis. 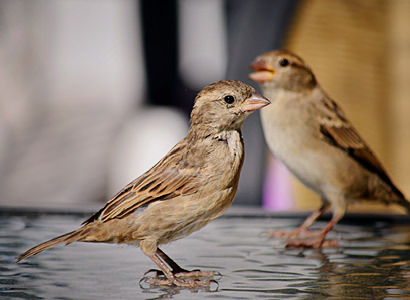 Sparrows also can be a source of parasites and insect pests such as bedbugs, chiggers, fowl ticks, fleas and mites. Sparrows are very aggressive and social birds, and often drive away the more desirable songbirds. Not only will sparrows monopolize backyard bird feeders, they also will move into nesting boxes intended for purple martins, or other more desirable songbirds. When sparrows become a problem, several things can be done to discourage them. Several methods can be used to prevent sparrows from nesting and roosting in urban areas. All building openings larger than 3/4-inch should be screened or blocked off. Outside structures such as signs and air conditioning units should be installed with no open space between the structure and the building wall. Where open spaces or crevices exist, bird mesh, netting or hardware cloth can be used to exclude sparrows from potential nesting sites. It is difficult to exclude sparrows from the typical backyard bird feeder. Their feeding can be minimized if no seed is scattered on the ground (where sparrows prefer to scavenge) and if large seeds such as sunflower seed is used. The larger seeds are preferred by many songbirds such as cardinals, while sparrows prefer small seeds such as sorghum or millet. Suet blocks and hummingbird feeders also will attract interesting bird species without providing a food source for sparrows. Altering vegetation may discourage sparrows from roosting and nesting in the yard. Trimming and pruning trees and shrubs will decrease the amount of available nesting space and open up the vegetation, which makes it less attractive for roosting. Several brands of repellents are available. These sticky substances can be applied to ledges, window sills, roof lines or anywhere birds are roosting. These repellents usually are effective but frequent reapplication may be required. Sparrows also can be repelled with “porcupine wires.” These are sharp, metal prongs that stick up several inches from the ledge or window sill and prevent the birds from roosting (See Fig. 2). Although this method can be expensive, it is extremely effective. Figure 2. Metal projections called “porcupine wires” can be attached to ledges or rafters to prevent birds from roosting. No truly successful alarm or distress notes have been found for use against the sparrow. Alarm notes designed for other species, as well as noise-making devices such as fireworks, blank guns, cracker shells and tapes of birds in distress, are sometimes effective, but usually only for a short time. Sparrows are relatively intelligent birds and adapt quickly to noises of this type. Most cities have ordinances against using noise-making devices, so check with your local police department before using them. Visual repellents are usually as ineffective as acoustical ones. Decoy owls, rubber snakes, scarecrows or foil strips hung from trees or buildings may deter sparrows for a short time. Eventually, however, the birds get used to them. The most effective approach is to use a combination of both visual and acoustical repellents. In some situations sparrows can be controlled by trapping. 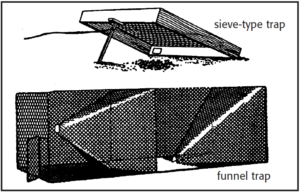 Of the several types of traps available, two of the most effective are the sieve-type trap and the funnel trap (See Fig.3). The sieve-type trap is simple to construct, but requires close attention for best results. A box is set on the ground and propped up with a stick. A string attached to the stick is pulled when the birds enter the area under the trap. The trap should be baited with seeds, bread or any other bait that sparrows feed on. The area around and under the trap should be pre-baited for a day or two to allow the sparrows to get used to the trap. The funnel trap is somewhat difficult to build, but is more effective than the sieve-type trap. In addition, because birds will trap themselves, the trap does not need to be observed constantly. Bait is scattered inside and around the trap. Birds enter the apex of the funnel that forms the entrance. Adjustable stiff wires woven or soldered to the tip of the cone discourage their attempts to back out. Other types of sparrow traps are available from hardware stores, feed stores or garden supply centers. Note: Be sure when setting traps to do so in a way that prevents capture of songbirds, which are protected by the state and federal government. Sparrow populations sometimes can be reduced by destroying nests and/or eggs at 2-week intervals during the spring and summer. A long pole with a hook attached to the end is an effective tool for reaching nests under rafters and eaves or in trees. For best results, nests should be collected and removed. This eliminates nesting material for rebuilding. English or house sparrows are not a protected species in Indiana and may be taken at any time; their nests and eggs also may be destroyed. Individuals with nuisance wild animal control permits can assist homeowners with nuisance English or house sparrows. The names of licensed nuisance wild animal control operators and additional information can be obtained from the Indiana Wildlife Conflicts Information Hotline at 1-877-463-6367.